This locomotive has run for approx. 15 minutes in each direction on a club's oval test track before being put into a showcase. It has been tested and runs well - a little light lubrication by the purchaser is recommended. Select MTH locos for shipping costs. A less common version with a Maunsell Chimney and lined out..
Dapol S.Allen private-owner 7-plank wagon in good as new condition. 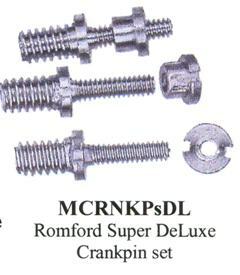 For shipping you must select "Small boxed kits" or "Special delivery" or we cannot supply. Darstaed tinplate van for 3-rail - Burgoynes in good as new condition. Darstaed tinplate van for 3-rail - Rowntrees in good as new condition. MTH 2-rail LMS Blue Coronation Set of 4 open 3rds in good as new condition. For shipping you must select "MTH coach set" or we cannot supply. MTH 2-rail BR Crimson & Cream Set of 2 side-corrdor 1st brakes & 2 side-corridor all 1sts in good as new condition. 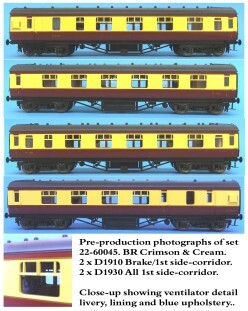 MTH 2-rail BR Crimson & Cream Set of 1 side-corrdor 1st brake & 1 side-corridor all 1st in good as new condition. 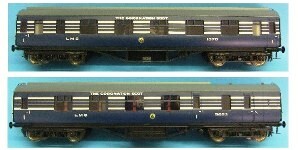 MTH 2-rail LMS Coronation Scot Set of 1 side-corrdor 1st brake & 1 side-corridor all 1st in good as new condition.